Dr. Terence Hammer is a primary care physician who practices in Palos Verdes. 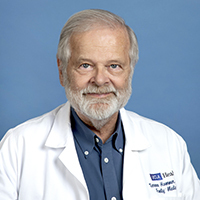 He is board certified in family medicine and sees patients of all ages. Dr. Hammer enjoys forming long-term relationships with families in the community, and has practiced in the South Bay since 1977. He focuses on preventive medicine and attends to everyone’s individual health care needs by addressing risk factors for conditions such as coronary artery disease, and finding answers for what’s going on when serious health problems occur. Dr. Hammer received his medical degree from the Stanford University School of Medicine and completed his residency in family medicine at the Contra Costa County Hospital and Health Centers in the East Bay region outside of San Francisco. He has been teaching medical students and other doctors-in-training for almost 20 years. When he’s not working, Dr. Hammer enjoys running, fishing, long-distance swimming, collecting modern and western art, and giving to charitable causes. He also enjoys spending time with his daughter, Katy. Fun fact: Dr. Hammer was raised in Oak Park, Illinois, the hometown of Ernest Hemingway and Frank Lloyd Wright.